The star witness against US President Donald Trump’s ex-campaign manager Paul Manafort has admitted he committed a host of crimes with his former boss, and confessed to stealing from him and others. In his first hour on the witness stand, Rick Gates catalogued years of crimes, saying most of his wrongdoing was committed on behalf of his former boss Mr Manafort, while other crimes were for his own benefit, including the theft of hundreds of thousands of dollars. He also made clear he was testifying against Mr Manafort in the hopes of receiving a lesser prison sentence, having pleaded guilty as part of a deal with special counsel Robert Mueller. Mr Manafort’s trial in Alexandria is the first to arise out the Mueller probe and marks a major public test of that investigation’s credibility. Mr Mueller’s team is investigating Russian interference in the 2016 presidential election, and whether any Trump associates conspired with those efforts. During the trial’s first week, Mr Trump lashed out publicly against Mr Mueller and said the entire effort should be stopped “right now”. Gates’s testimony against Mr Manafort marked a shattering end to a relationship that made the two political consultants millions working for foreign politicians and led them both to prominent positions on the Trump campaign. “Did you commit crimes with Mr Manafort?” prosecutor Greg Andres asked Gates. Presented with a copy of his plea agreement, Gates said he conspired with Mr Manafort to falsify his tax returns. Mr Andres asked Gates whether he understood that his lies and omissions were illegal. Asked why he had lied, Gates said he had done so at Mr Manafort’s request. Gates said he and Mr Manafort had 15 foreign accounts they did not report and they knew it was illegal. “Mr Manafort directed me to not report those accounts,” Gates testified. 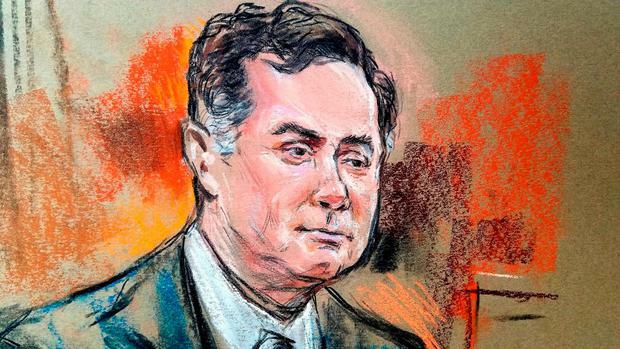 Gates also said Mr Manafort had directed him to report money wired from his foreign bank accounts as loans to reduce Mr Manafort’s taxable income. By reporting it as a loan, Gates explained, he could defer the amount of taxes he owed. Gates said that even while he was committing crimes with his boss he was stealing from him, creating false bills to siphon off hundreds of thousands of dollars from the Cyprus accounts. That testimony probably explains one of the minor mysteries of the first week of the Manafort trial. Employees of various stores and service providers testified last week about Mr Manafort spending millions of dollars on suits, home entertainment systems and cars, and some were shown phony invoices. They said they had never seen them before. He had also lied in a deposition in a civil case against Mr Manafort involving a private equity fund. Gates said prosecutors agreed not to pursue charges on those matters, and dropped a second indictment against him accusing him of bank and tax fraud. Gates said he was guilty, having wired money from Cyprus through the United Kingdom to the US without paying taxes on it for himself.